Tokyo: destroyed by the earthquake of 1923 and again by the firebombing of World War II. Does anything remain of the old city? The internationally known Japanese architectural historian Jinnai Hidenobu set out on foot to rediscover the city of Tokyo. Armed with old maps, he wandered through back alleys and lanes, trying to experience the city's space as it had been lived by earlier residents. He found that, despite an almost completely new cityscape, present-day inhabitants divide Tokyo's space in much the same way that their ancestors did two hundred years before. Jinnai's holistic perspective is enhanced by his detailing of how natural, topographical features were incorporated into the layout of the city. A variety of visual documents (maps from the Tokugawa and Meiji periods, building floorplans, woodblock prints, photographs) supplement his observations. While an important work for architects and historians, this unusual book will also attract armchair travelers and anyone interested in the symbolic uses of space. 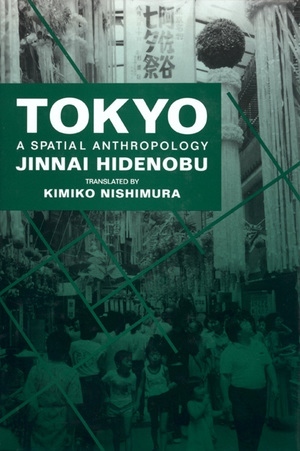 Jinnai Hidenobu is Associate Professor in the School of Architecture at Hosei University in Tokyo.